‘Tis the season for holiday parties! GBCA will be celebrating this year at The Bearman Gallery in the Frederick Douglass-Isaac Myers Museum on Thursday, December 13 from 6 to 9:00 pm. This show seeks hand-pulled prints and book arts that explore creative approaches and boundary pushing with techniques and / or concepts in printmaking. Juror’s awards. The Bath House Cultural Center and exhibition curator, Jose Vargas, invite visual artists to submit entries for the 25th Annual El Corazón art exhibition. “The Scout,” by Baltimore artist Karen Klinedinst, was part of a trio of photographs awarded first prize in Adkins Arboretum’s nineteenth annual Juried Art Show—Discovering the Native Landscapes of Maryland’s Eastern Shore. Submissions are being accepted for the 2019 show. The Baltimore Office of Promotion & The Arts (BOPA) announces that the application for the 14th annual Janet & Walter Sondheim Artscape Prize is now available. The prestigious competition awards a $25,000 fellowship to assist in furthering the career of a visual artist or visual artist collaborators living and working in the Greater Baltimore region. The Sondheim Artscape Prize also provides regional artists the opportunity to exhibit their works at the Walters Art Museum. The deadline for submissions is Tuesday, January 15, 2019. I am grateful for so many things—my family, the incredible GBCA staff, the GBCA Board of Directors, and all of GBCA's members and supporters. I am also grateful to live in a city with ferociously committed artists and cultural leaders. Baker info Sessions, Deadline and OFF THE WEB! As you prepare for your holiday weekend, we wanted to remind you that you now have less than 30 days to complete your Baker Artist Portfolio to be considered for one of this year's Baker Artist Awards! Or login here to update! Baker OFF THE WEB opens Tomorrow + new INFO SESSIONS announced! 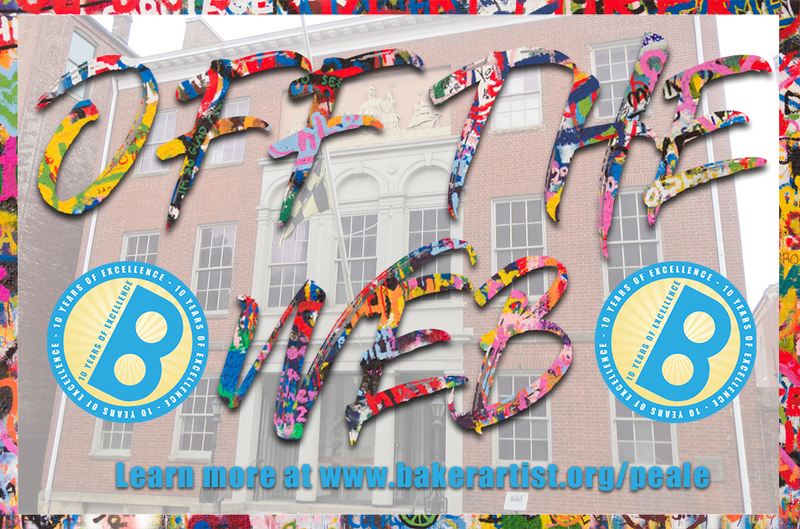 Baker OFF THE WEB opens Tomorrow at the Peale! Plus new Info Sessions announced for artists! The Urban Arts Leadership Program exists to connect emerging leaders of color with host organizations in the arts sector that are committed to racial equity and inclusion. The ideal organization is among the growing list that see the advantages and value, and are intentional and consistent about infusing their organization with talent that ensures people from all backgrounds have the opportunity to succeed. National Philanthropy Day, a program of the Association of Fundraising Professionals, pays tribute to the invaluable contributions that philanthropy has made to our personal lives, our nation, and the world. Congratulations to the William G. Baker, Jr. The Body Altered/Adorned is a community design challenge and exhibition that explores the idea of the manipulated body through the use of raw materials or wearable objects. Using materials sourced from items that modify the body in some way, artists are challenged to create a piece of jewelry or sculpture that explores the idea of the manipulated body. Or, through the use of raw materials, artists can create a piece of jewelry or an object that is meant to modify or alter the body. Resulting work should either clearly utilize provided source materials OR augment the body. Artists are needed to join the 2019 Teaching Roster for the Maryland Centers for Creative Classrooms (MC3)! MC3 is the research-based, professional development series designed to support arts educators in developing skills, knowledge, and dispositions needed to lead quality arts-based instruction for 21st century learners. The holiday season is quickly approaching! Now is a great time for Maryland Artist Registry users to update profiles with new work and to join the MSAC Marketplace so that we can promote your works for sale this holiday season. 2019 Theme is FACT AND FICTION. Curators are invited to propose exhibitions that explore the tug of war between fact and its “alternatives” today—particularly in projects that probe artist self-mythology or self-obfuscation, History and its white lies, and all other topics that fall in the liminal space between subjective and objective: propaganda, appropriation, memory, cultural conspiracy, religion. Full details on the theme are outlined HERE. CulturalDC is seeking artists of all kinds to submit new and engaging works for our Works-in-Progress initiative. Whether you’re a performance artist, singer/songwriter, interpretive dancer, comedian, playwright, clown, etc., we have a spot for you! We will be programming up to 3 projects for one-time engagements, with a possibility for further development. The will of man in recreating worlds through which to plunge and surprise him self has always been witnessed through the means dedicated to art. Especially today, with photography and new digital media, not only the artists but any individual, has available means that allow us to recreate fictional reality more and more illusory and more easily. Baker takes over the Peale! The midterm elections are TODAY, and all of us at GBCA are excited to vote for the candidates we believe in. No matter what policies and positions you support, or what side of the political spectrum you fall on, there’s one thing we can all agree upon: casting your vote really does matter!